Hi. So i joined another forum. A reptile forum. Because i'm either bying a bunny or a tortois. I need to (s)mother something. Currently i am more into tortoise because you can bring them in flights without them getting a heart attack. Also, one of my roommates is allergic. So tortoise. But i need to build a terrarium (tortoise-table). A habitat. And i am seriously struggling as to what kind of bedding i should get, because accordning to the internet; everything is dangerous. any of you have experience with tortoises? or animals..? I see you found the reptile forum, so I've got nothing more to add. Turtles are semi aquatic, tortoises ain't. I can't imagine either one of them appreciating snow. people at the reptile forum won't answer my question. but i am getting one (or two!) and make an indoor garden for them. promise i'll tell ya'll about it. People on the reptile forum are obviously cads and lowlifes. We'll take good care you here. Tortoises are no different from anyone; they like potato crisps and snickers bars. But steer clear of the diet cola or you'll screw up their sugar cravings and they'll get fat. I've just realized I have no idea what tortoise poop looks like. You'll have to report back. As for bedding, just put in natural stuff like pebbles. They don't need bedding since they sleep inside hard shells anyway. I'm not sure you even have to put in something you can change like straw because tortoises don't poop. Obviously. I've never seen one do it so they can't possibly poop. Not like goats who poop at the drop of a hat like frickin' gumball machines. Okay, so I'm wrong. But they do it very, very slowly. halfwise, all your advice is wrong on so many level. I can only assume you are trolling. They need earmuffs for those cold Norwegian winters. Just trying to help. Okay, so you've shamed me into actually being useful. You've probably found this already, but I found the drawing for "soak your tortoise once a week" to be particularly charming. I liked the big red arrow indicating "push him down in here" while the tortoise was clearly flailing its legs around in alarm. only cats and more cats and one or two husbands, but that's easy, its beer and football. We have a dachshund/Jack Rusell cross, she turned 11 in July and is still going strong (and sleeping well ), always been a dog person, not a fan of cats. My advice is: don't kill it. Here ya go Norc, an alternate pet courtesy of Malick in the Whatever thread. 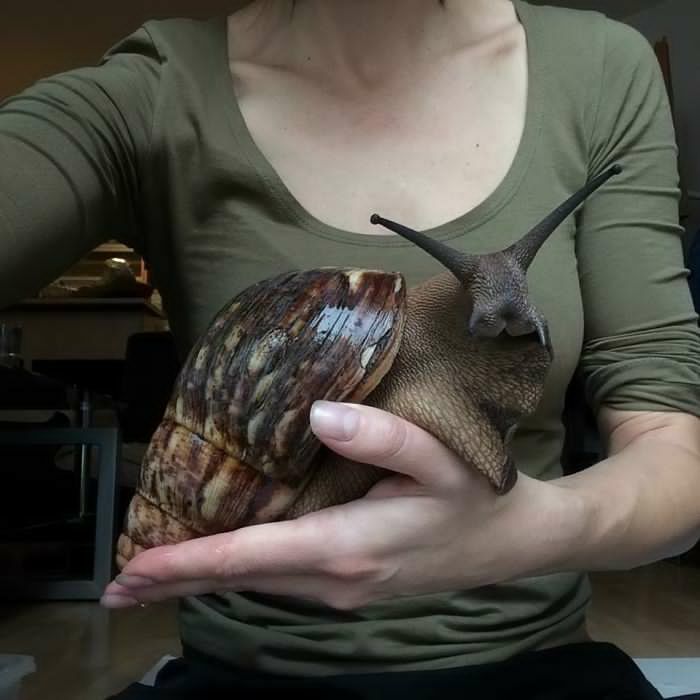 Someone photoshop on a top hat and monocle for that snail please. When I worked at a summer camp in central texas I had a pet tarantula. They are remarkably cool with being picked up and carried around, but get annoyed when you keep trying to feed them for entertainment. Thunking cockroaches against the head gets old I suppose. When in West Africa I had a pet scorpion almost the size of my hand (this is a story I could stretch out for a long time, and I think did somewhere in these pages). It would wake up at night and try to get out; its outstretched body with grasping claws would be silhouetted against the moonlight, giving me nightmares. So I had to let him go. These were both wild. I'm not sure 'pet' is really the right term. Captive is more correct. If let out these fellas weren't gonna bother finding their way home. I wouldn't do that these days. That GIF of the turtle is so sped up! What kind are you going to get Norc? A mega-huge tortoise? Or a little tortoise? I don't know anything much about tortoises, but I read that the Mediterranean Spur-thighed Tortoise (Testudo graeca) is popular. Don't tortoises live for a long time? It sounds like a large commitment. Edit: These ones live for over 125 years, and up to 200. How 'bout a baby guinea pig? Don't get a guinea pig if you plan to keep one in your bedroom. They're nocturnal - they wake up at night and start rooting around and squeaking. And significant poopage, though that may be because the one we had was on the larger size. I say stick with the tortoise. Not cuddly, but won't be gnawing on things all night to keep it's teeth sharp.